To register, please go to Career Central/Job Posting No 65090. 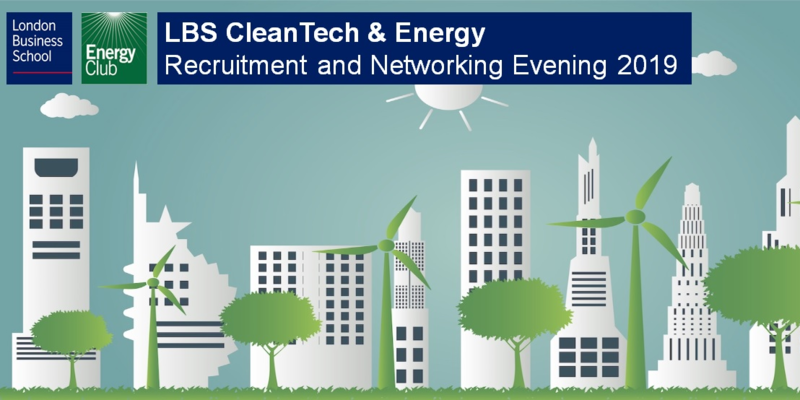 LBS Energy Club and Career Centre are delighted to invite you to the CleanTech & Energy Recruitment and Networking Event, taking place on Tuesday 23th April. This dedicated event will allow you to connect with the leading companies from across the CleanTech and Energy sectors to discuss internships, projects, and permanent job opportunities. The event takes the form of a career fair with each company having a table to be based at and where they can distribute recruitment material and have the opportunity to talk individually with you (there are no presentations). It will run from 7pm– 9 pm at the Regent’s Park LBS campus across the Dining Room and the Marquee and is open to students from across all programmes and alumni. We will be working closely with all the companies attending to ensure they have relevant opportunities to promote, please keep checking the Career Central jobs board for further information and to view job opportunities in advance of and after the event. Typical roles in the CleanTech and Energy industries include: Market Research, Business Development, Product Marketing, Product Management, Operations, and Finance. Before the event, think about the companies that you really want to speak to, do some research about the representatives attending, look at the company websites, have a good understanding of what they do – this will help you to have some insightful conversations. You will be asked to submit your CV through Career Central for inclusion in the CV book that will be shared with all the participating companies in advance of the Event. In order to have your CV included, we must receive it by the 12th April 2019. If you need further information or have problems with the registration, please contact Ania (amirkowska@london.edu) in the Career Centre or the Energy Club Careers Team.